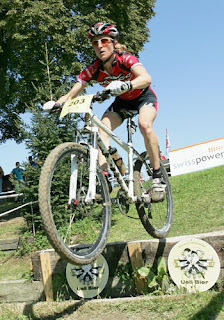 On my way to a 4th place finish at the SwissPower Cup Finals Race in downtown Muttenz near Basel. Yeah!! I’m back in Switzerland hanging out with my friend Sandra and her Aunt and Uncle. Ricky Federau and I arrived in Zurich Thursday after a sleepless 16hrs of travel. Our VW Golf was waiting at the rental agency and was the perfect fit for our bikes and gear. Awesome! With my second immersion in German it’s getting a little easier and I’m picking up some good phrases thanks to Ricky and his remembrances of German classes as a kid. He taught me the lyric above - I am a foreigner and I don’t speak German well – a convenient phrase to have at my disposal. So it’s been a matter of trying to get our sleep schedule switched to this time zone, not an easy task and working the travel kinks out of the legs before Worlds. The three of us headed to Basel, near the border with Germany this weekend. 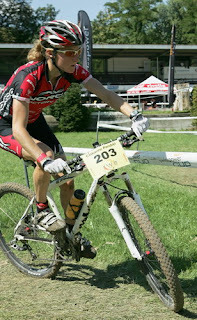 On Sunday we raced the SwissPower Cup finals. I have to say it was one of the more interesting courses I’ve done, but definitely wouldn’t go so far as to say it suited me. The race started on a rough horse track. The week before we arrived had been so rainy much of Switzerland was flooded and the track had water ruts. Being more like a road race start, I took it pretty casual and wasn’t fighting for the front. With 2.5 start loops I thought I’d have lots of time to move up, but when I made my move with half a lap to go, dropping to the bottom of the track I found it was really sandy and slow and got shut out heading into the “technical zone” which consisted of three 3 foot drops and a sharp uphill. Some girls were struggling with the drops and it got all clogged up. So when the course opened up again I was way off the leaders. Good going Kika! I chased like crazy across the dead flat road stretch and into the paved climb and caught up to the top 6 or so girls by the single track climb. I was done though. I was wheezing and my legs hurt bad. The lead three girls –including Sandra - still had a sizeable gap that I was going to have to recover before I could close. The descent was slick clay, but they had removed a tight corner making it a bit better to clean. It was still challenging to stay upright and putting a foot down meant you got nasty guck in your pedals and cleats. The single track up and down section only took 4 minutes. The rest of the course was pancake flat and a large amount of it was paved. From the descent we headed into a singletrack section along a stream. Nothing too tricky, just some twisty trail with a couple short steep poppers. The final section of the course was within the race track’s centre field. It was basically an obstacle course that had us riding up stairs, jumping a gap over water, riding logs, little bridges and drops. It was kinda fun, but got redundant by the 5th of 7 laps. I was able to catch Sandra by lap 3 or so and after putting a little gap into her we basically maintained the same pace all race. Had we known that was to be the case we could have teamed up. I was pulling away on the climb and she was reeling me in on the flats. Unfortunately I didn’t get my chance to ride up front because of a poor starting approach. The top 3 women, Sabine Spitz, Lene Byberg and Katrin Leuman road almost the entire race together which would have been fun. But Sandra and I had a good time and finished up with me in 4th and her in 5th. She wound up 4th overall all in the series. Didn't I used to do this on horses? It wasn’t really the race performance of my dreams, but I was definitely glad to get this one in before worlds. It’s been a month since my last race and I could definitely still feel the travel in my legs. Ricky too suffered in the race. He came up with several colourful descriptions in German and English to describe the way he felt and raced. He finished up 35th of 103 world class guys though so not too shabby off of Jetlag. We head out tomorrow (Tuesday) for Scotland and I am feeling confident my legs will be happy come race day Saturday. Wish me luck! All the best at Worlds!